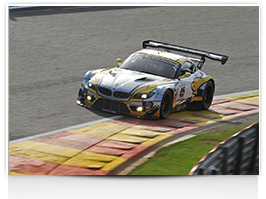 The Team Marc VDS BMW Z4 has taken its first win on Pirelli tyres at the Spa 24 Hours thanks to a stunning performance from Nick Catsburg – who crossed the finish line and set fastest lap of the race – Lucas Luhr, and Markus Palttala: the first Finn ever to win the Spa 24 Hours. The trio of drivers had to deal with diverse conditions that included heavy rain, fog and sunshine, sealing BMW’s 22nd victory on the event: the first since 1998. Despite the variety of conditions, the drivers had to rely on just two types of Pirelli tyre during the 24 hours, the DHC slick (a hard-compound, low working range tyre) and the softer rain tyre. Despite almost zero visibility and grip in the torrential rain at the beginning of the race, the crew maximised the capacities of their Pirelli tyres in order to stay out of trouble from start to finish: key to their success at Spa. They also knew exactly when to change to the slick tyres as the track dried up overnight, although conditions remained extremely treacherous off the racing line, which caught out a number of drivers – leading to several safety cars in the first 12 hours. The number 45 BMW Z4 held the lead until the final morning, when a mechanical issue forced it to retire while Dirk Werner was driving. The sister number 46 car then overhauled strong opposition from Audi and Mercedes to claim the lead, setting the fastest lap of the race in the early hours of Sunday morning when the track was finally dry. Nine different manufacturers were represented in the 57-car field, with a wide variety of vehicle architectures, but they all used the same two types of Pirelli tyre, in different sizes according to wheel dimensions. With the cars competing in the Blancpain GT Series similar to the supercars that Pirelli equips on the road, the tyres used in competition at the Spa 24 Hours underline the direct technology transfer between road and track: the result of more than 100 years of motorsport heritage, stretching all the way to Formula One. After two dry years of the Spa 24 Hours, this year’s event threw a huge climatic challenge at the drivers and teams, but the 9000 tyres supplied performed perfectly, leading to a close competition that remained in doubt right until the closing minutes. One of the cars that looked set for victory was the number 99 Rowe Mercedes SLS AMG GT3 crewed by Nico Bastian, Stef Dusseldorp and Daniel Juncadella, which finally succumbed to mechanical problems in the final hour but had made brilliant use of its Pirelli tyres right up to that point. Eventually the number 2 Audi of Dirk Muller, Stephane Ortelli and Frank Stippler finished second, one lap behind the leader, having already shown its speed by qualifying on superpole using the DHC slick tyres on Friday afternoon. The final podium place at the finish was occupied by the number 5 Audi of Christian Mamerow, Christopher Mies and Nicki Thiim: a consistent frontrunner from start to finish of this round the clock classic. Pirelli’s senior engineer Matteo Braga commented: “Congratulations to the winners: we were able to achieve our target of supplying a product that was easily adaptable to all the different brands of cars, allowing them to be extremely competitive with each other throughout the 24 hours, in diverse conditions. This is at the heart of the popularity of this fantastic Blancpain series. We were also able to deliver our product on time, every time, supporting each team in their individual choice of race strategies.” And finally… a few key numbers that characterise Pirelli’s biggest-ever logistical operation within world motorsport, at the Spa 24 Hours. In total, we brought 9000 tyres, using 21 trucks that were driven for a total of around 50,000 kilometres to get here. These were fitted in a fitting area that measured 700 square metres, by a team of 50 fitters. 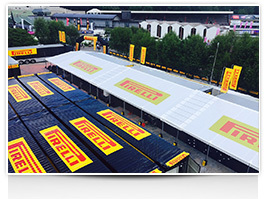 They were supported by 20 engineers, as well as 20 other Pirelli people in logistics, management, and other roles. The fitting line was able to deliver a fully-fitted tyre every 15 seconds at maximum capacity, and replace the entire Spa 24 Hours field with tyres within one hour. The tyres need accessories: we also brought 500 kilograms of balancing weights and 5000 valve caps. The work during the race comprised a shift of around 36 hours on-track; at night our work was illuminated by 1200 lights. Over the course of the weekend our dedicated restaurant served approximately 1200 meals. Not to mention 5000 cups of (strong) espresso to keep everyone awake. The result of all that hard work? Three happy winners on the podium.